Whether you’re looking for the perfect holiday gift for your barre bestie, or some motivation to work harder in class, our new holiday collection has just what you need. Custom made in collaboration with two cutting edge activewear brands, the pieces are designed to make you look and feel your best, inside and out of the studio! The first collaboration is with LA-based, fashion-forward performance brand Vimmia. Vimmia shares our mission to empower women to be the best version of themselves. Together we believe in helping women get stronger and healthier every day and to feel beautiful along the way! The line features soft, beautiful colors and our new brand phrases such as “Wear your Will” & “Strong is Beautiful.” These pieces are subtle and stylish, giving you flexibility to go from the barre to the bar! Tie up the side in a knot, throw on your leather bomber jacket and some boots and go have that glass of wine you worked so hard for in class. Click here to see more styles from our Vimmia collaboration. Our second collaboration this season is with Texas-based activewear brand DYI: Define Your Inspiration. DYI creates lifestyle apparel with the perfect fusion of fashion, performance, and function. We share the belief that when you look good, you feel good. It isn’t just clothing, but a mindset. This core collection with DYI is composed of four classic branded tops from DYI’s most popular styles. These include the “Flowy Draped Racer Tank,” a loose-fitting tank with a built-in shelf bra that doesn’t sacrifice style. The intricate mesh detail on the back adds sophistication, making it a must-have for this season and beyond. 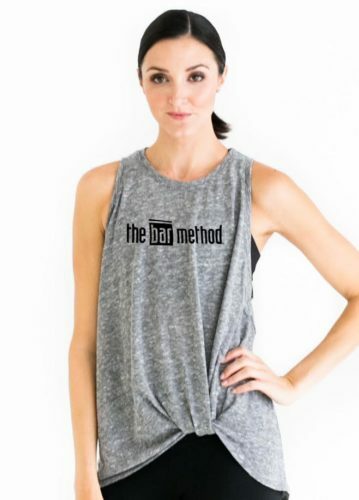 Our favorite piece from this core collection is DYI’s most popular tank, “The Knot So Fast Tank” in heather grey. It has a longer hem in the back and stylish knotted front making it easy to throw on for your workout, to run errands, or have lunch with the girls. Click here to see more styles from our DYI collaboration. Be sure to check with your local studio to try on some of these pieces (please note that studios carry different styles). And, you can always visit our online shop and order today…but don’t wait, these gorgeous styles will go FAST!